What is Google Daydream and the Google Daydream View? Without being overly technical, Daydream is a new way to experience games and video on your phone. Instead of looking down at your screen and swiping or tapping, you can put your phone in a specially made headset and experience a 360-degree immersive environment that allows you to really step into the world instead of viewing it on a small screen. Daydream View is the first headset built for the Daydream platform. It's comfortable enough for anyone to wear for long periods of time — even if you wear prescription glasses. It also comes with a special controller that lets you move your hand in the real world and see that movement in the virtual world when you're wearing the headset. This is Google's first attempt at a more comfortable way to explore VR, and it has been designed to withstand drops and bumps without issue. You can take this headset with you just about anywhere and enjoy your VR apps and games wherever your phone is. A front panel folds down, you drop your Daydream Ready phone into the opening, and close the panel. The connection between the phone and the headset is wireless and the headset has an auto-alignment system to ensure you're getting a clear view of the display. 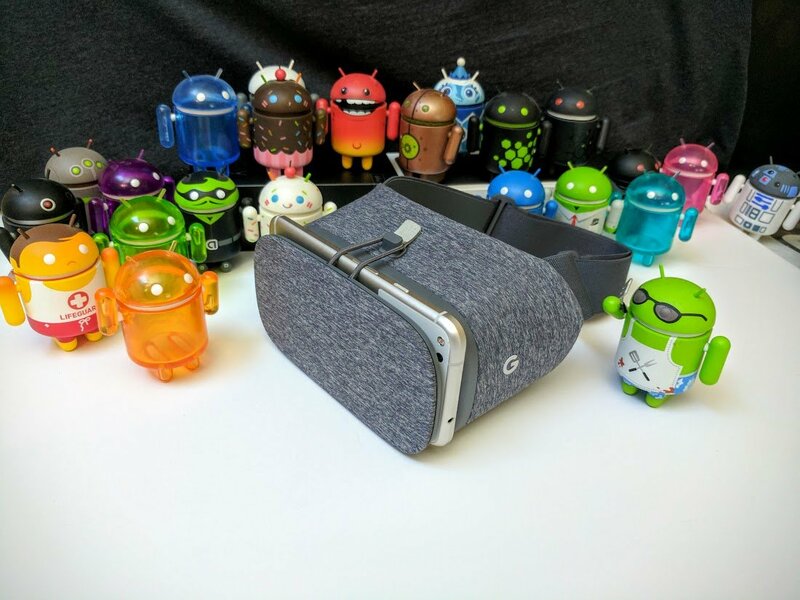 It doesn't get much simpler than Daydream View, and when you put your head in, the whole world is replaced with a virtual one. What can I do in Daydream? There's really no limit to what can be done in Daydream. You can watch movies on what looks like a massive projected screen with Google Play Movies, watch news stories as though you're standing where the action is with CNN VR, or step into photos you've taken on your phone with VR Photos. If games are more your style, you can sit in the cockpit of a ground-skimming hovercraft in PolyRunner VR or fight hordes of totems and monsters in Hunter's Gate. You'll also find puzzle games and science exploration apps ready to install and enjoy. Google's current list of Daydream apps already includes over 50 titles, with even more planned. Netflix and HBO have both debuted, action-packed games have arrived, and there's a big push to bring the web to Daydream with a special VR browser. Like I said, there's really no limit. So it's replacing Google Cardboard? Not exactly. Google is positioning Cardboard as the nearly-free thing anyone with any kind of phone can use for "snackable" VR experiences. If you want to get a better experience from a 360-degree video or you're interested in adding depth to something like a walk-through of a house you're interested in buying, Google Cardboard is still the go-to experience. It's fast, inexpensive, and runs on just about everything. Google Daydream is a more complete experience. When you put the headset on, there's a whole virtual world for you to explore. Each app is a part of the larger experience, which is similar to what you see with some of the more expensive VR platforms for computers. Daydream has been built for you to want to use it for extended periods of time, maybe to watch a movie or explore a place in the world you've never been before. Will my phone work with Google Daydream? Your current phone probably will not, but your next phone might. Currently, the only phones to support Daydream are the Pixel and Pixel XL, Moto Z, and the ASUS ZenFone AR. The Pixel and Pixel XL were both created by Google and were the first Daydream-ready phones released, with the understanding that many phones in the future would work with Google Daydream. The Moto Z and the ASUS ZenFone AR are now part of this understanding. Those aren't the kinds of things you're going to see listed on the back of the box in your local store, so Google is making it easy with stickers that read Daydream Ready. If you happen to have a Google Pixel, Moto Z, or ZenFone AR, Daydream is absolutely worth checking out. Anyone thinking about Daydream support for a phone they might have later need to consider what they actually want in a VR experience. If you want the highest quality games with the most immersive experience you don't have to worry about things like money or space, Daydream isn't what you want. If you're looking for the cheapest VR headset you can buy, Daydream isn't what you want. If your goal is to have a lot of fun with the most comfortable, portable VR that isn't going to break the bank, Daydream is what you want. If you want the best way to experience Google's apps and services in VR, Daydream is what you want. If you're ready to dive into Daydream, you have a couple of options. Currently, Daydream View is available for $99 from the Google Store, as well as Best Buy.